Hiding your guns, extra ammunition, cleaning kits, and repair kits, is a great idea for many reasons. Not only is finding great hiding spots important when tucking away firearms, you also must prepare the weapon to life underground, or for exposure to the elements, so it is still functional an ready to fire after you retrieve it. When hiding weapons, you must take into consideration how deep you are burying the cache, what type of material the housing unit is comprised of, and not just possible exposure to water, but moisture as well. The decision to hide guns at all has sparked some very heated debate on survival boards. Some posters called it a ridiculous act at best, and an exercise in futility, at worst. Perhaps the reason some folks calling themselves preppers mocked the idea of hiding weapons, is because they assumed the motivation behind such an act was only to protect them from confiscation. The posters said if the government was confiscating guns, they would find the hidden ones, you would get caught when you shoot it, and severe punishment, maybe even death, would be levied on those Americans caught hiding guns. One poster aptly said if the government started confiscating guns, most gun owners probably would already have been shot down while holding their favorite firearm in their hands. I am definitely a subscriber of the “cold dead hands” mindset, but that does not mean I believe neglecting to hide guns, for a vast array of reasons, is ever a bad idea. While living for eight long years under an increasingly socialistic liberal and anti-Second Amendment regime, concern about gun confiscation were constantly surfaced by gun owners for largely logical regions, based upon the way the political winds were blowing at the time. Today, we have a gun-loving patriot in the Oval Office, but since the occupant of the People’s House can change every four years, I doubt the worries about gun confiscation ever truly dissipate. After all, ammo sales just spiked enormously (315 percent, in fact) in California in preparation for a new stringent anti-Second Amendment law. The first day of 2018 brought with it restrictions on ammunition purchase in the Golden State. Now, gun owners can no longer purchase ammo online and have it sent to their homes. Instead, the ammunition is send to a licensed gun dealer and the buyer can only have it handed over after going through a background check. 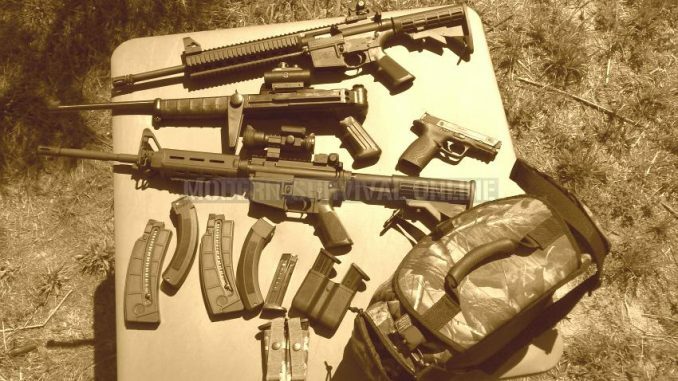 Besides government gun confiscation, there are a plenty of good reasons to hide some of your guns and ammunition. During both good times and bad, like a SHTF scenario, a single attacker or entire marauding horde could get inside your home and clean you out…quickly. If you do not have enough space in your safe for all of your guns, ammo, cleaning kits, and firearms repair parts, as well as your bows and arrows, they would be either ruined or burned to a crisp during a fire. The odds of fires starting and spreading rapidly will vastly increase during a doomsday disaster. If you have to flee your homestead or bug in location, either temporarily or permanently, you will want to be able to get your hands on guns and ammo as soon as possible. If you work or go to school away from your bug in location or bugout retreat, hiding caches of guns, ammo, cleaning supplies, reloading supplies, and a repair kit along the routes you may travel to get there, makes good sense. • Handguns can be hidden in voids and false bottoms cut into kitchen cabinets, the floor, dresser drawers, and closets. • Inside junk cars and appliances to help avoid being discovered by metal detecting devices. • Buried in the ground anywhere that is not likely to flood. • In a hollow log or tree. • Inside a wood case secured firmly inside a couch frame so it will not be detected or rattle when the couch is moved or flipped over by thieves. The best way to prevent detection of the case hidden inside the couch frame is to completely remove the fabric frame covering on the bottom of the couch and replace it with a new liner after securing the case inside. • Commercially manufactured furniture designed specifically to hide weapons or other valuables. • In a waterproof container sunk inside your well, rainwater catchment system, or pond. • Soda pop, deodorant, hairbrush and similar types of small decoy safes are great for hiding ammo. • Fake light sockets are too small to hide guns, but they can hide ammo and keys to locked caches. • Using the inside of your staircase as a hiding spot would give you a lot of storage. Making sure the opening to the stairs that lift up to reveal the hidden nook, make this spot for a weapons cache vulnerable. If you go this route, hide some type of valuable in the opening, so the thieves or marauding horde members think they have struck pay dirt and then hide handguns and ammo in false bottoms on the underside of stairs further back and up and away from the obvious storage spot. There are pros and cons to every suggestions on this list. What matters far more than where you hide your gun (I am sure you have tons of great covert spot picked out already) is HOW you choose to hide it. Burying caches made out of PVC pipe because it is waterproof has become a very popular way to hide firearms and other valuables. When sealed properly, a PVC pipe is definitely waterproof, but that does not mean the inside of the pipe will not fill with moisture, be impacted by moisture if buried above the frost line, or worse yet, be found by someone with a metal detector. When burying a weapons cache inside any type of case in the ground, you should always bury some type of metal above and/or around it. Bury something of far lesser value also made of metal above your hidden weapons, so the person swinging the shovel or metal detector will think they already found the treasure and stop digging. You can also half-submerge or bury in the dirt common junk items, like old car parts, scrap metal, etc. for the same purpose. Preventing moisture from damaging the ammunition and guns should be a top priority. If you do not do this right, you could dig for an hour with your bare hands to get to the life-saving weapon only to find a ruined piece of junk. • Bury or hide the weapon in a spot where the air temperature will be as stable as possible. • Make sure no two pieces of metal are touching each other. • Always bury the gun cache below the frost line to decrease dramatic temperature changes. • Shrink wrapping or vacuum sealing the gun and the ammo is highly recommend. • Store silica gel or desiccant – a hygroscopic substance that is often used as a drying agent, with your ammunition, especially if the ammo is several years old already, or it’s going to be stored for the long term. • Wrap the boxes of ammo and accompanying desiccant inside a towel together before dropping them into your cache or hiding spot – even if you’re using a metal ammo can as a cache. • Tupperware containers, large plastic totes, and plastic coolers all make sturdy and weatherproof caches. You will be able to store wider items in a cooler than you can a piece of PVC pipe – at least PVC pike portable enough to pack into the woods with you to hide. • Always seal the lids of your PVC pipe or plastic storage containers serving as a weapons cache with silicone or a similar sealing agent. Duct tape is a prepper’s best friend, but will not get the job done as well as silicone when it comes to protecting the contents of the cache from moisture. • Oil or grease your firearms well before putting them in the cache. Over-oiling or greasing is actually best. Gently but firmly wrap the oiled guns or rifles in a towel before putting them in a cache to hide. • Grease up you empty ammo mags and wrap them in a towel as well, before storing them in a weapons cache – never store ammo in the mags or you will have metal touching metal and that is not a good thing during long term storage. • Invest in a Pelican case if burying a shotgun or rifle. They provide a great protective covering for the essential self-defense and hunting weapons. • Store not just ammo and mags, but handguns in your metal ammo cases as well. They are large enough to hold ample mags and ammo and still accommodate space for your pistol. Keeping all of the items in one compact case will make for a whole lot less digging when you rush to find them. Army and Navy depot still sell metal ammo cases for reasonable prices, as do most gun and agricultural stores, like Rural King and Tractor Supply. • The deeper you have to dig to get below the frost line, the more durable your cache must be. Building a wood or metal box around a plastic cache might be necessary to protect the content inside. • When you determine what the frost line is for your area, dig one foot beyond it just to make sure you are not only correct, but give a little extra protection to the weapons and related materials, in your cache. • Consider breaking the gun down, greasing all part, and wrapping them separately before storing them in a cache. It will take you a minute or two to put them back together, but you will likely be dealing with far fewer oxidation issues this way. If at all possible, remove wood stocks from your firearms before storing them to better preserve them. • Pack sensitive weapon accessories, like scopes, flashlights, and night vision attachments with a lot of desiccant and insulation in a cache you have sealed abundantly well with silicone. • Some gun owners have had great success with taking rounds of ammo out of their cardboard boxes and storing them in vacuum sealed bag with desiccant or silica gel. You run the obvious risk of having metal touch metal with this type of storage, but according to the folks who had tried it for the short term (about 12 months) the gel or desiccant did its job well and there were no moisture or corrosion problems. • If you are going to bury the weapons and plan not to touch them for at least 5 to 10 years, do it at least five feet below ground to prevent for erosion, animal digging, flooding, etc. Thing will work their way out of the ground over time. We call all the cool junk we are still finding around our retreat “Terry’s Treasures” in honor of the former owner. Some of the cool junk, things as large as livestock gates, were simply allowed to lay where they fell and were reclaimed by the earth over time. It took several weekends spend working on our farm road with the tractor and our backhoe after heavy rain to find treasures inching their way back out of the ground. • Stashing a gun repair tool and a hefty cleaning kit in your weapons’ cache is highly recommended. You need to be prepared for a gun that is not in full working order (at least not immediately), and to deal with ample surface oxidation. • Due to movement of the soil, it is not recommended to leave a cache in the same underground spot for more than a couple of years. • If you are planning on leaving a weapon cache underground without digging it up to check on it every few years, grease the heck out of every single crevice of the rifle, shotgun, or handgun before wrapping it up and putting it in the cache – even if you are using a Pelican case. • Nitrogen-purging, ample grease, or cosmoline might be necessary, for the preservation and functionality of the firearm, if it has been stored for a decade or more. Silicone cloth sleeves and vinyl sleeves are available for handguns and long guns. The vinyl sleeves seal to be completely waterproof. Both are inexpensive. Lube the firearm really well (Vaseline makes an excellent outer coating as it will not oxide), place in a silicone sleeve and then place in a vinyl sleeve. Place a couple of silica packs in the vinyl sleeve, squeeze out as much air as possible and seal the vinyl sleeve. Your firearm could well be submerged in a nearby stream or pond and be protected for a lifetime. when packing away a firearm or ammo packs – go with modern technology – mylar – same bagging material that’s been the proven method of long term food storage for the last 25 years … grease it up – keep the enclosed desiccant pack and 02 absorber separated – heat seal the bag – ready to go for the next 25 years …. Thank you for sharing the tip. Mylar has almost as many great survival uses as duct tape!Heat sealing the bag properly will make all the difference, especially if the firearm will be stored in or around moisture or submerged. For decades cosmoline was used for greasing up and storing firearms. I appreciate Tara’s wisdom regarding the concealment of weapons. Good stuff, a lot of which I’d not have considered. Her work is a real help. She really needs to use the grammar / spelling correction device with which Microsoft Word Office is equipped, or at least get someone to proofread her work before it is posted. There were at least fifteen incorrect spellings and misuse of syntax. Not a good recommendation for readers to invest their time in an item. The high grade of her content indicates that this is a problem of carelessness, not ignorance. It seems spelling and syntax errors are very common, of late. Whether just poor schooling or a foreign writer, I don’t know. with an excess of error in their articles. For storage, I use a product called Fluid Film, it is lanolin based, stays where you spray it, easily wipes off with a rag and leaves a lubricating layer on the gun. It has been in use on the metal hulls of fishing vessels in Maine and on farm equipment to prevent corrosion.